Oh my goodness, this corn pudding was SO good. We served this with the Smokehouse Chicken I posted yesterday. We only made half of the recipe and regretted not making the entire thing. This only requires a few ingredients and a few minutes to whip up. It was so easy that Chicken Legs made it for us. Corn isn't in season right now, so I used some frozen silver queen corn. It worked great. This corn pudding was perfectly sweet and savory. You could make this a Southwestern Corn Pudding by adding a can of chopped green chiles and 1/4 teaspoon of cumin. Whisk together eggs, whipping cream and butter. Gradually add sugar mixture, whisking until smooth, stir in corn. Pour mixture into a lightly greased 9x13-inch pan. Bake for 45 minutes our until golden brown. Caroline - it took about 40 minutes to bake the half pan of corn pudding. brilliant! ta :) Pinned it and will make tonight... yum! I can tell by the pic that it must have been amazing. This looks SO good. But I love all your recipes. Good ol' down home cooking at its best. Love your blog!! I agree that your recipes are down to earth, easy and YUMMY! Thanks for the Pinterest link - it works, but I tried to save this post and ziplist couldn't find it. I'm sure I would like it with green chilies. Looks delish. I love that dish that it's cooked in! Is it Pampered chef? Love your blog! 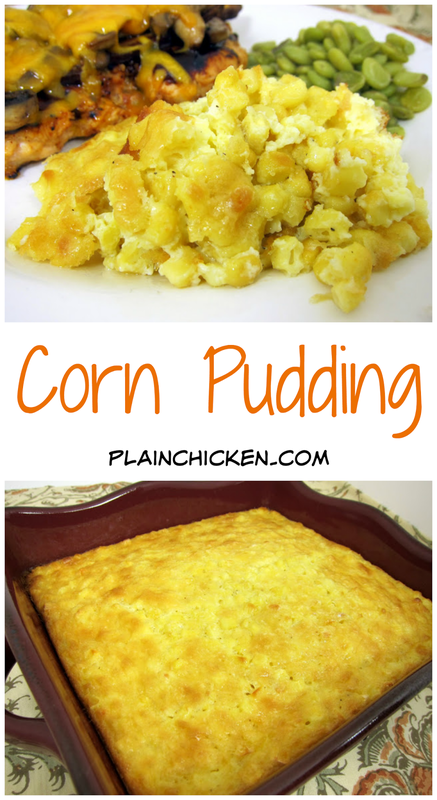 I am thinking of making your corn pudding for Thanksgiving. I was wondering if you have or think it would be okay to make this the day before? Also what kind of corn did you use? Frozen or can? Thanks! Caroline - I think it would be ok to make it ahead of time. I used frozen silver queen corn. Oh yum! I might have to add this one to my Thanksgiving menu!